Heard about the tanning and vegetables study? Basically, if you eat a bunch of vegetables chock-full of carotenoids, you look less pale. And this tanning effect is more attractive than one produced by the sun or booth, according to study participants. The vegetables named in the article are carrots, tomatoes, sweet potatoes, bell peppers, spinach, kale, and cantaloupe. A little more research shows that beet greens, turnip greens, collards, cabbage, winter squash, and pumpkin also have high levels of beta-carotene. And according to Mother Earth News, the eggs of free-range chickens contain 7 times the beta-carotene of regular eggs. Beta-carotene is what causes the yolks to be that happy neon-orange color. 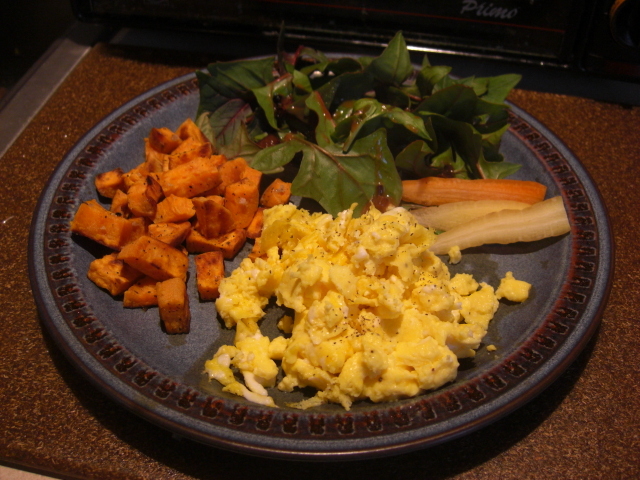 I’ve definitely been eating my share of greens, carrots, sweet potatoes, winter squash, and eggs lately. And I think I know what they’re talking about. The effect may be short-lived – only a day or two, but in the mirrors at the gym last week after eating the lunch pictured above, I noticed my skin tone looked more even than normal – like it does with a little sun. (This was at the beginning of a workout. At the end, I looked like a strawberry.) I also remember getting into the bath a couple of weeks ago and thinking my legs looked oddly not pale for the end of January. I’m one of the paler people on the planet, so the effect may be more obvious on me. But I’m also eating a lot of these vegetables, and the ones I’m eating are more likely to have high amounts of nutrients, having been grown in good soil nearby. It definitely doesn’t top my reasons for eating more local food, but it doesn’t hurt either!